Ilya Ivanovich Mashkov (17 (29) July 1881, the village of Mikhailovskoye, hopersky district, Oblast of the don Cossacks (now Uryupinsk district of the Volgograd region), Russian Empire — March 20, 1944, Moscow, USSR) — Russian and Soviet artists. Avant-garde, an active participant and one of the founders of the community of "Jack of diamonds", a member of the Association "World of art", in Soviet times, a member of the Society of Moscow artists, Honored worker of arts of RSFSR. Features of the artist Ilya Ivanovich Mashkov: brightness, riot, wild passion of the early works. Bright palette, the thick smear, the expressiveness, the use of pure color. Bright, edible and memorable still lifes. Socialist realism in his performance today, I want to call postmodernism. Ilya Mashkov was clearly a kinestetik*. How else would he have made such a palpable sensual, carnal beginning in your image? Hands themselves drawn to his crisp, fragrant The "bread". Amber juice, it seems that this second squirts of overripe plums. From lemons in the picture the mouth makes the mouth. And body multicolored bathers exude such warmth that the pattern can be cold in the hall. Mashkov was born in the village of Mikhailovskoye, now it’s Volgograd oblast. The family lived in poverty, so long training Ilya is not the sun: after three years of study at the parish school, gave it to "the people". He helped in the trade shops and, in his own words, fiercely hated it. Outlet were hours when the boy could draw. His early studies were purely practical in nature — he created signs and painted posters for the shopping of the owners of the shops. In General, young Ilya liked to work with his hands — hence, perhaps, poignant and sensual, kinesthetic pictures do not look, feel their skin, feel their taste and smell. One day the art teacher, who taught at the gymnasium and saw pictures of young Mashkov and asked if he thinks about teaching painting. Ilya was unspeakably surprised: "Did you learn that?". Before the budding artist has opened the whole world, which, it turns out, it is possible to seriously do what he really liked to draw. Finding the purpose, Ilya Mashkov resolutely turned in her direction. 28 February 1989, he left the shop (and forever remember the date) and decided its time to devote to exam preparation. In the same year he entered the Moscow school of painting, sculpture and architecture. His teachers were Corinne, Vasnetsov, mountain, and most importantly — the Tretyakov gallery and the Rumiantsev Museum in which he spent all his spare time. The training was successful in 1902 Ilya Mashkov was awarded the prize of Sergei Tretyakov. But the thing — even though he found its recognition, the money has not started to flow flow. It is not known exactly whether he himself decided, or someone suggested it, but true fact that in 1904 Ilya Mashkov left College and opened her own private school of painting, which lasted until 1917. He taught Mikhail Larionov Natalia Goncharova, Pyotr Konchalovsky. With Mashkov Konchalovsky in General, actively collaborated, they were United and intimacy in art, and friendships in life. In 1905 Mashkov married the first time (and did not stop) to a girl of Italian descent, Sofia Kenzari. "The joy of the savage"
In the Studio Mashkov was born the future "Jack of diamonds" one of the most famous avant-garde communities in those years. Things went well, and already in 1908 Mashkov traveled to Europe and became acquainted with new artistic trends in Germany, France, Spain, Austria, England. And in return he decided to continue his own training, for which again went to the Moscow school of painting on Serov and Korovin. 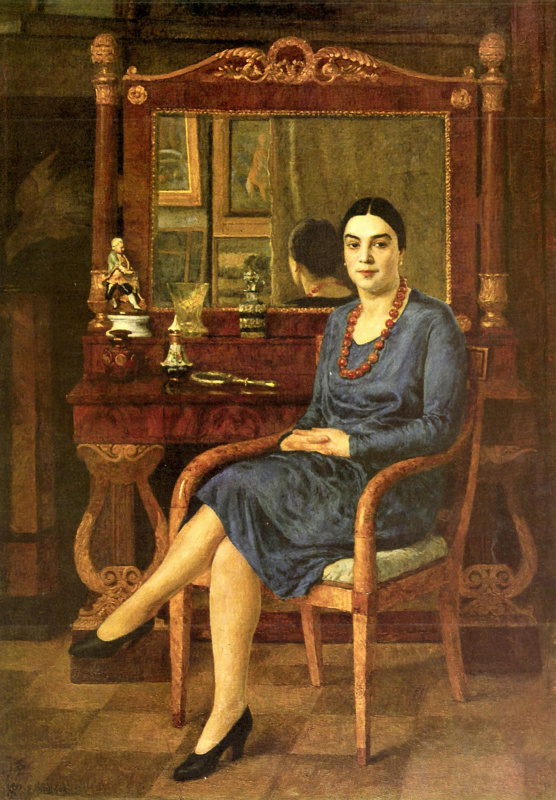 In parallel Mashkov participated in exhibitions. Success came to him quickly, but with a hint of scandal. 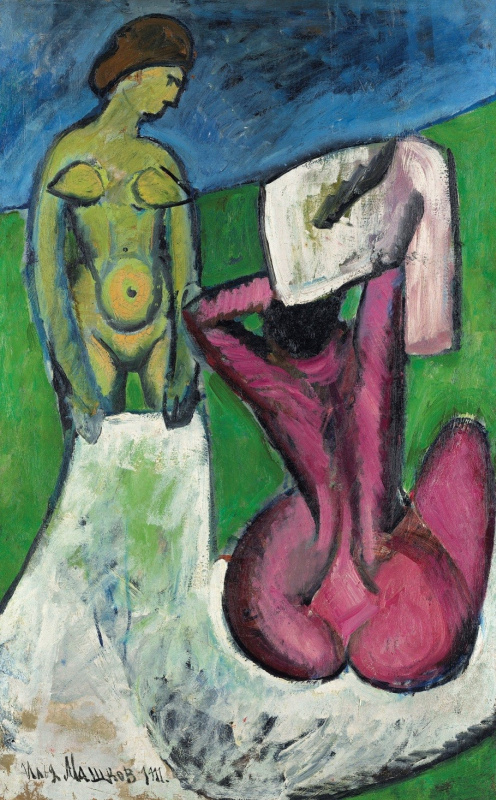 In the paintings Mashkova even against the background of "leaving the gap" of the avant-garde is striking indomitable wildness, the passion, the frenetic joy of the flesh of the depicted things. Someone from the art critics of those years described the mood of the paintings Mashkova: "you can feel the joy of a savage who first sees this". His paintings are exaggerated, exaggerated, very natural. And given the historical context? Even if we agree with them "wow-effect", what a storm they have produced during the formation of the "Jack of diamonds", the very existence of its challenging academic painting, previously unchallenged ruling over the minds? "At this time in Russia the greatest success I have, in the sense of abuse"laughed the artist. Mashkov became known, but continued training, are not particularly constraining your vision and not trying to conform to the requirements of the teachers. In particular, it attempts to portray pure color women’s nature (which he subsequently did), understanding seen only from Korovin. 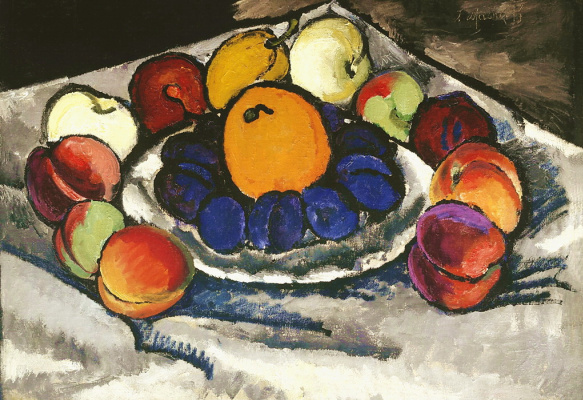 If most of the "bubnovaya" had a clear influence of cubism, Mashkov by far gravitated to unleash the color of Fauvism. Mashkov was very grateful Korovin for understanding and upset the gap with Serov. But what joy for him was following him with the exception of the recognition of the teacher! 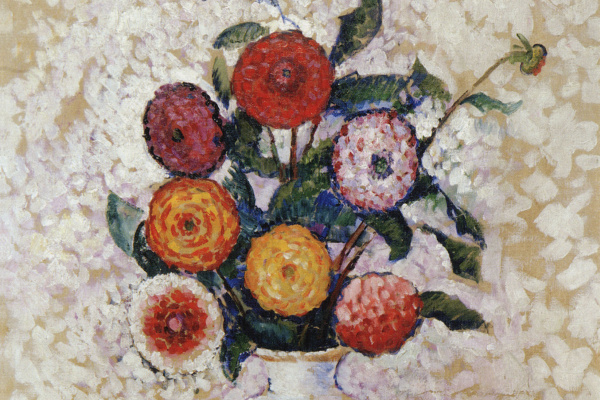 Several paintings of Ilya Mashkov was exhibited at the salon d’automne in Paris in 1910. 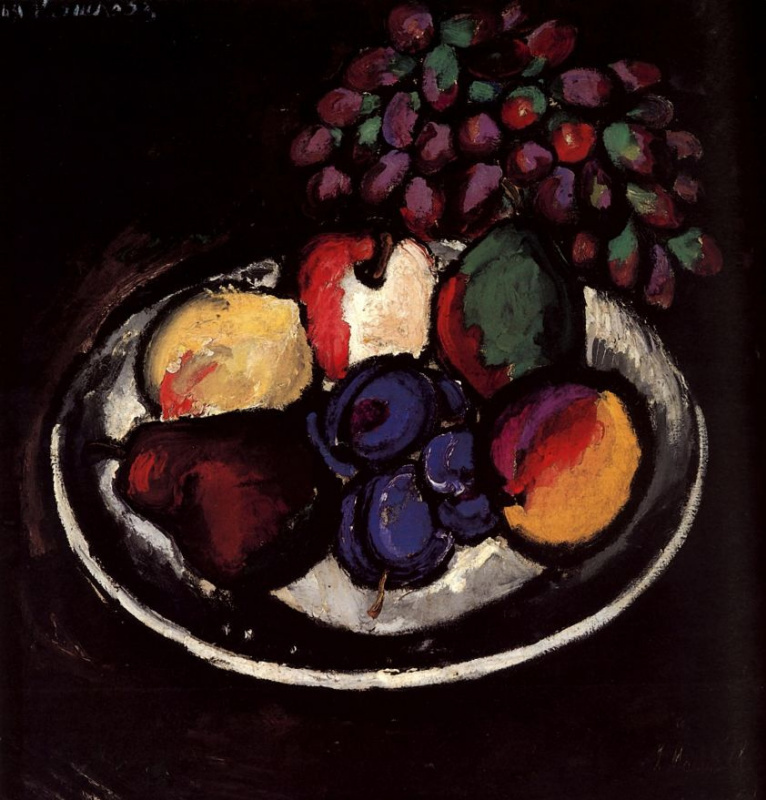 The artist was very pleased to learn that Serov and Matisse unanimously advised well-known collector Morozov to buy it "Blue plums". In addition to the unbridled "wild" skills to pass on the canvas the color sense of feeling, Mashkov differed organizational skills. He longed to organize, assemble, do — it’s time to think about his desire to create with my hands. He was one of the organizers of "Jack of diamonds", then his Secretary. In 1915 he was accepted in the "World of art". In the same year — a second marriage, this time with his student, the artist Elena Fedorova. It is shown in the "Still life with female figure,". 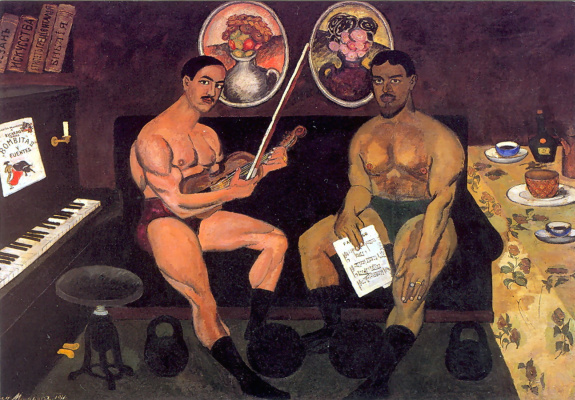 The revolution Mashkov was received with enthusiasm, like many other avant-gardists. Engaged in the Union of artists, was in a variety of communities and organizations, taught painting in the Second Free state art workshops (which became the Moscow school of painting, sculpture and architecture), and then at the Higher art and technical studios. 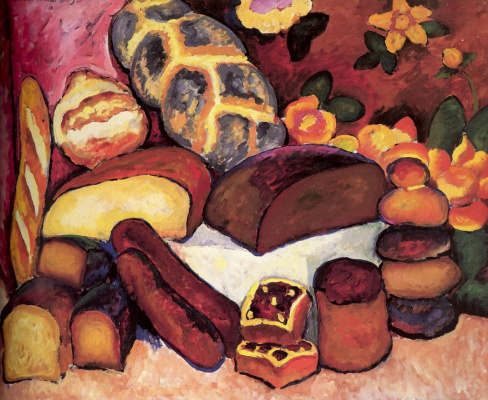 Parallel to the rapid organizational activities, he began writing an entirely different wing pattern, the so-called "Museum still life Mashkov". This abundance of porcelain, scarlet furniture, decoration. Comparing with historical context, understand that in the post-revolutionary years, quite actively destroyed. And it’s not about random coincidence. 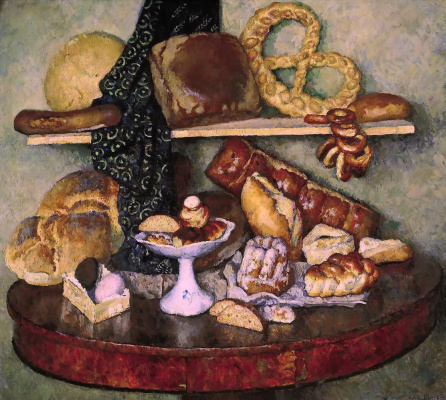 The exhibition of Association of artists of revolutionary Russia (AHRR) "Revolution, life and labor" in 1925, the year Mashkov exhibited the famous triptych "Eatables Moscow": "Bread", "Meat, poultry" and Fruit. In the manufacture of components of the "Bread" took part for the third and last wife Mashkova, the artist Maria Danilova, which made some of the "attributes" with their own hands. Looking back at historical events, we understand that the country was at this time painfully moved away from attempts to create war communism and ahead of us loomed not a Golden age. And suddenly — such luxury, such opulence! Farewell to food? It’s not that Masha was a dissident — not at all. In his youth despising authority, he fights for every letter and every title in the USSR and proudly quoted of place and out of place abbreviations of organizations, which "consists of and involved". In this case, you may have a situation when creativity goes beyond the views of the individual. And Moskovskie incredibly bright, attractive, definitely delicious the dishes seem to foresee their fate — a long time to become from the food on the dummies. The picture was taken, and the artist waited for the masterpiece on the revolutionary theme. 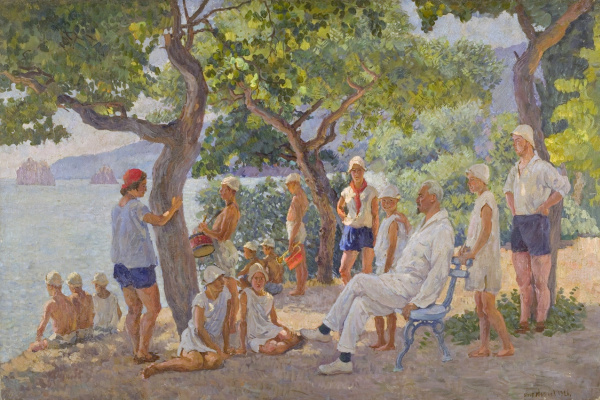 He goes to Crimea, collects impressions, wrote impressionistic landscapes and portraits — sent to the palaces of Crimean workers and peasants, many bathers, the beaches. Portraits Mashkov is not peculiar to the psychology of the people he represent the impression of form, function. But still waiting for the revolutionary murals. 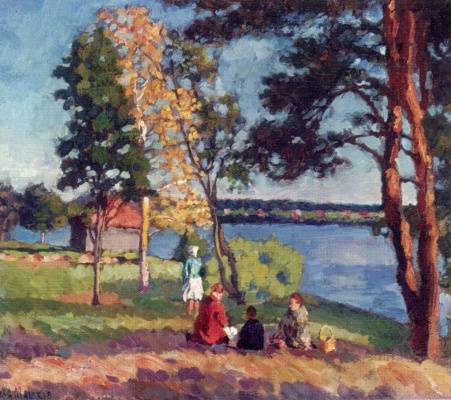 And then Ilya Mashkov decides to go to his Motherland in Volgograd oblast, where he wrote a series of portraits of peasants and tries to teach painting peasant children, and also exhibits extremely active in the establishment in his native village in the former premises of the Church of the House of culture. 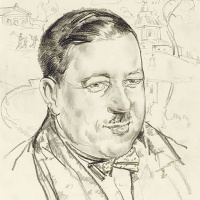 On his own he made the sketch, made the sign "Building of Socialist culture (DSC) in the name of the honored worker of arts, Professor of I. I. Mashkov". It sends messages to the organs and complains to them on the irresponsibility of villagers, which, fists, hard-nosed, no glow of happiness, realizing the opportunity, throwing everything to build communism. For example, complains that his efforts in creating the DSK "kulak agents and other harmful elements in city of Rome, and in Khutor Mikhailovsky — no taste. To establish who is personally such persons for the accuracy and business use, if desired, the above authorities can find out in no time for yourself". And in his paintings rosy-cheeked collective farmers picture of health, watch them warm and well fed! All in the best traditions of the still life Mashkov. But today we know that 30 years is a severe famine in the Volga region… is a Singer of flesh and sensuality again writes that the leaves, already gone? Sudden postmodernism or software Stalinism? A little pleasure to distract from the voluptuous still life by Ilya Mashkov on his life in the Soviet years. Too vigorously he tried to build communism in the territories, to whom he could reach. Preserved numerous letters to the NKVD with a listing of the old offenders, and the prosecution "rabble" in the perpetration of the obstacles the Soviet regime. During the great Patriotic war Mashkov went on their own in Lefortovo hospital, wrote militaryguerrillas and medical workers. A little over a year he did not live to victory. Mashkov’s paintings glorifying Stalin’s power, are second bottom, which he himself, judging by the facts of his biography, they have not invested. Last "The bread," the 36-yearalready begins the era of repression Is finally complied with the order of the state and created a revolutionary themed picture? A huge canvas, the center of which the baked bread, the emblem of the USSR, bread to the ears in General, Stalin’s Empire of bad taste, as the brand sells power. And only then realize the essence of metaphor. The attributes of the Soviet regime that you can eat? 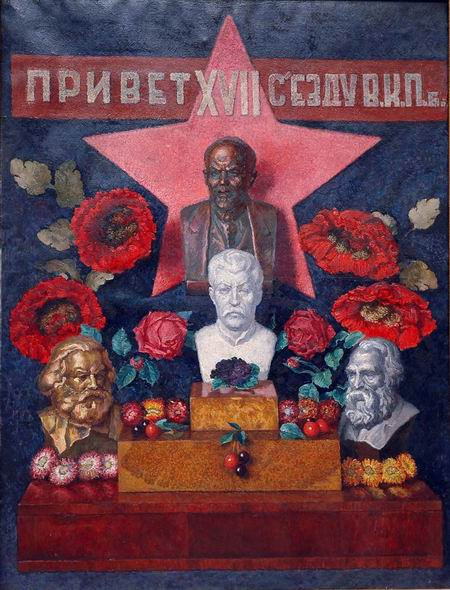 And the apotheosis of the worship of Stalinism "Hi, XVII Congress of the CPSU (b)" with the current position can be classified as postmodernism, not the brown-nosing… of Course, at that time, the perception of these paintings was different. The good mysteries of the art, that the answer sometimes is manifested many years later. *Kinestetik — the one who, receiving information, perceiving the surrounding reality, tends to translate everything into the language of bodily sensations, taste, touch and smell, trying to touch the interlocutor, even if he doesn’t see him. Portrait Of Z. D. R.